Cheyanne Warren was crowned as Miss Sno-Eagle 2018-2019 at the November meeting of the Sno-Eagles Snowmobile Club. Cheyanne is from Eagle River and is a Northland Pines High School senior. After graduation she will attend UW Green Bay to study music and the performing arts. Cheyanne has been riding snowmobiles since she was 5 years old. As a child she rode with her dad – a groomer for the Three Lakes Trails. Over the years she’s helped with many fundraisers for the trails including sandwich sales, grass drags, oval races and the gun raffle. Since childhood she hoped to become part of Derby Royalty, and last year Cheyanne was a Derby Princess. According to Cheyanne, she is excited to have been selected as Miss Sno-Eagle and is anxious to show her love and passion for snowmobiling and to become part of the snowmobiling community. As a past member of the National Business Honor Society Cheyanne participated in many fundraising events including the Pink Ribbon Riders, Three Lakes Fire Department Picnic, Three Lakes Shoot Out, Polar Plunge, Three Lakes Fish and Wildlife Banquet and Basketball Tournament, Kids Free Fish Day, Northwoods Children’s Museum Tea Party, Donkey Basketball, Pumpkin Fest, Cranberry Fest, Roadside Cleanup, and the Center for the Arts Ball. She has been active in music and participated in the Solo Ensemble and advanced to the State level. She participated in the Northland Pines High School Musical, The Music Man. As an avid photographer, Cheyanne has her own photography business. Cheyanne is a Cheerleader for Northland Pines High School this year. 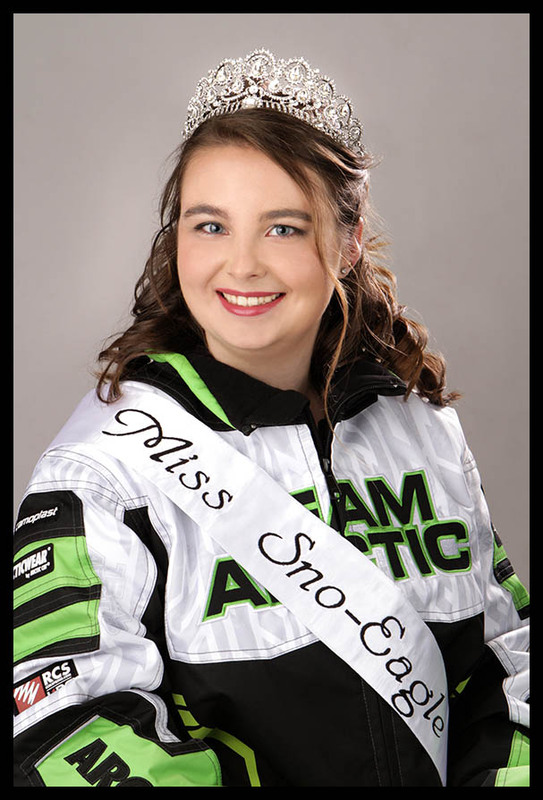 As Miss Sno-Eagle, Cheyanne will represent the Sno-Eagles at events throughout 2018-2019 some of which include the World Championship Snowmobile Derby, Derby Vintage Weekend, Ride with Pride Raffle, the 4th of July Parade, and membership meetings. Cheyanne is featured on the Sno-Eagles 2018-2019 trail map cover. A $500 scholarship donated by Boat S’Port will be awarded upon completion of Miss Sno-Eagle responsibilities. In addition, she will receive a custom embroidered snowmobile suit donated by Boat S’Port. Hair and make-up for the trail map photo was donated by Synergy Salon and Spa. TJ Gaffney Photography donated the map cover photo shoot.